Good Quality - The hammock is made of super strong 210T parachute nylon material. This soft, breathable will last for a long lifetime. Setup Fast And Easy - Our package includes hammock straps and carabiners for easy setup. It will take less than 3 minutes. As travellers ourselves, we know that space in your bag is a premium, but those small camping hammock just won't cut it. Money backIf you don't love it,you can still return it within 30 days. This is our crazy promise! 【Large and Fit 1&2 Person】-Size:102 x 55 Inches,camping hammock for 1 or 2 people, made of strong 210T parachute nylon material which is soft, breathable and mildew-resistant. The hammock hold up to 400bls,we test Maximum up to 660lbs. No need worry about the rope breaking,The hammock with Free Bug Net. 【Comfortable and Mosquito-Free】-This Outdoor hammock with Mosquito net provides a more comfortable sleeping environment compare with other traditional hammocks. It keeps you away from bugs' disturbing .Green Color is easy to blend with nature. 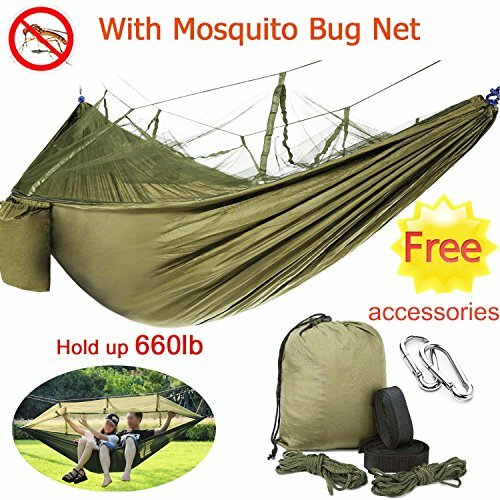 【Easy to Carry and Install】this double hammock is lightweight-only 1.87lbs when packed,Included simple accessories,2 flat rope,2 steel hooks,2 mosquito net rope ,1 Storage bag,Just need two trees and install it.even a novice and a kid can quickly install!.For safety, It is better that the tent hangs not to exceed 40 inches from the ground. 【Used for Holiday&Travel 】this folding hammock is best choice for Holiday or outdoor Travel,It can be used in many places,such as Hiking Camping Beach Island Backpacking Backyard Lawn Room Bedroom,you and your family kids or friends can enjoy every outside trip in summer,this Backpacking hammock is a good gift for birthday,Holiday Day.just enjoy it. 【Easy Clean and Dry Quickly 】parachute hammock is made of strong 201T nylon material, easy to clean,Don't rub off,you can wish it by hand or washing machine Nylon material is breathable and Dry Quickly, you can Repeated use it.